The stand-on mowing revolution started right here. Our Standers today are even more refined, agile, and well balanced than ever before. There is nothing quite like a Sport. It is light, fast, compact, yet offers comfort surpassing any other sit-down zero turn. With the option to sit or stand, you can adapt to the terrain depending on where the mower needs traction. Ideal for small-to-medium sized properties, with a seat! Ideal for tackling the most versatile lawns of any size, with a seat! Velke Walk Behinds are perfectly balanced for optimal control on hills and minimal turf damage. Offered in both comfort grip and pistol grip configurations. With commercial grade components and heavy duty construction, the MMZ and ZTO offer industry leading productivity and value. Before launching Wright Manufacturing, Bill Wright started the landscaping company "Lawn Wright". Over the years he had ideas for new mowing technology and invented the grass gobbler in 1983, the Velke Sulky in 1988, and the stand-on mower in 1997. All of his innovations put the landscaper’s needs first. While competitors mix and match, all Wright products are spec’d with 100% heavy-duty commercial components. This saves your team time and money, season after season. Standing is a more ergonomic work position. Sitting for long periods of time causes numerous issues including tight hipflexors, hamstrings, and lower back fatigue. 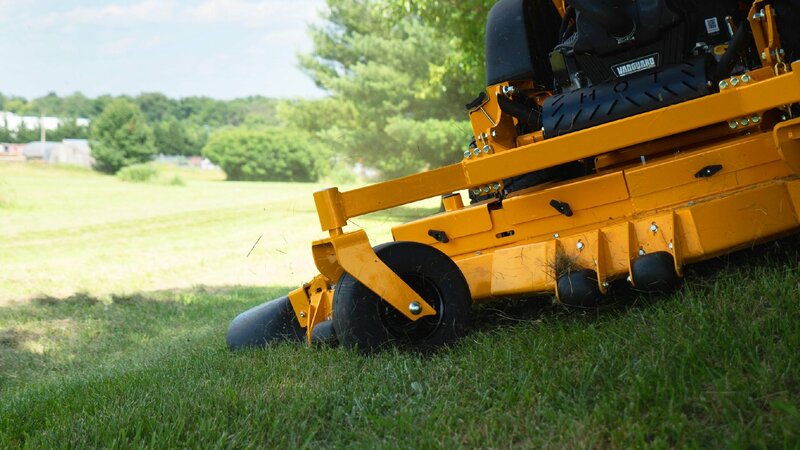 The Stander has a shorter length than any other mower of the same width. This lets you cut those hard to get spots, saving time trimming. High productivity allows the Stander to get the job done with less time and fuel. Economical doesn’t have to be slow! The Stander features an open platform that allows you to bail out should you feel uncomfortable manning the machine. With its open platform design, the Stander lets you duck down to avoid overhead obstacles such as tree limbs. Short overall length allows more mowers on a trailer and makes unloading an easier task. Walk-behinds are agile and light. Zs are powerful and fast. The Stander combines all these attributes into one powerful package. The Stander has the best weight distribution of any stand-on mower. This was done by placing the engine, transmissions, deck, and platform as close to the center of rotation as possible.